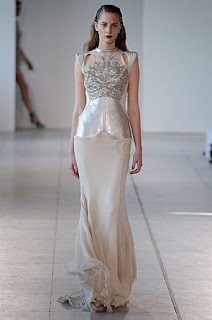 This collection by Antonio Berardi for SS12 has got to be one of my favourites (along with Erdem's) from LFW. Every piece was so striking without being too overwhelming, executed by his choice of adding hints of texture/beading/futurist influences to his classic tailoring. I love how every outfit is so wearable too! I can't get enough of those beaded trousers. Ohh, what a stunning collection! 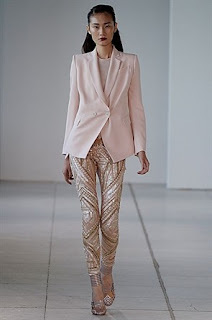 <3 I especially love the pastel blazer - so gorgeous! Oh, I love Antonio Berardi - what an exquisite collection! Seriously, I'm enamoured by the detail of every piece. So meticulously beautiful!